I believe every life has hidden songs that hang by twin threads of music and memory. I believe in the songs that have never been played for another soul. I believe they run between the rocks and the creekbeds of our lives. There are songs that cannot be heard by anything but the soul. Billy Allman is a man devoted to what he believes he is called to do, operate a radio station for the people in his small town of Dogwood, West Virginia. Billy forsakes many things..his health, relationships with others, in order to keep the station running. Why is this Billy's dream and why does he feel so strongly about it? Is Billy just another man or does he have a special calling on his life? 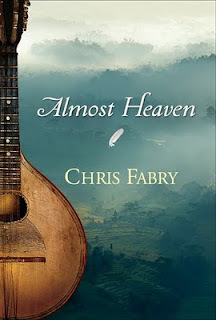 Almost Heaven tells the story of Billy's life, from a tragic but miraculous day in his boyhood to the many things he suffered in his adult life. It's a story meant, I think to be an example of how important one person's life is and how the hardships we endure have a purpose and the way we respond to them and our faithfulness matter. Unfortunately I didn't really enjoy the book. It felt very forced, which may be a consequence of a clear agenda and the kind of life Billy wanted to lead. He wanted to constantly tell people about God. And to top it off, in case we missed that Billy's life mattered, there were occasional chapters told from the point of view of an angel observing Billy's life telling us how impressed he was with Billy and filling in blanks. Also, the angel was meant to demonstrate the spiritual warfare going on over each faithful person's life. Maybe it's the fact that I don't particularly like fictionalized angels that seem human. Or that Billy himself got on my nerves. I just wanted to like this one so much more than I did. There are some things I liked. I like that the setting was different, all too often stories take place in the usual places. There were some passages of writing on music that were lovely. And I read the first section without ever feeling like I wanted to put it down. Also, the book deals with an issue I haven't seen before in Christian fiction in a sensitive and bold way.